RICHLAND, Wash. — Anyone who owns an electronic device knows that lithium ion batteries could work better and last longer. 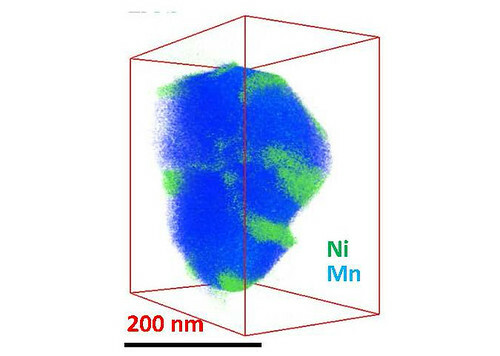 Now, scientists examining battery materials on the nano-scale reveal how nickel forms a physical barrier that impedes the shuttling of lithium ions in the electrode, reducing how fast the materials charge and discharge. Published last week in Nano Letters, the research also suggests a way to improve the materials. Reference: Meng Gu, Ilias Belharouak, Arda Genc, Zhiguo Wang, Dapeng Wang, Khalil Amine, Fei Gao, Guangwen Zhou, Suntharampillai Thevuthasan, Donald R. Baer, Ji-Guang Zhang, Nigel D. Browning, Jun Liu, and Chongmin Wang. Conflicting Roles of Ni in Controlling Cathode Performance in Li-ion Batteries, NanoLetters Sept. 17, 2012, doi: dx.doi.org/10.1021/nl302249v.